Stan and Gill Bruce have done a lot of original research on the Sternberg family and its connection with Lüneburg. I gratefully acknowledge this and thank Stan for his contribution to these pages. There was a general assumption by those of us descended from the Sternbergs that the name was probably Jewish and that our ancestor had come to Britain as a refugee. Research by my father some years ago began to cast doubt on this theory and the subsequent discoveries by the Bruces, David Oulton and Basil Wood have established that the Sternbergs were rooted in the Christian faith three hundred years ago. I now believe that the origin of the name is derived from a place (cf Sternberg and Lüneburg), but maybe future studies will reveal more. Hinrich was Musician at the Monastery School in Lüneburg from 1716 to 1734, and Town Musician (Ratsmusikant) from 1734 to 1757. J.S. Bach had been a choirboy at the Monastery School, enrolling in 1700, and graduating in 1702 after receiving a comprehensive musical education there. 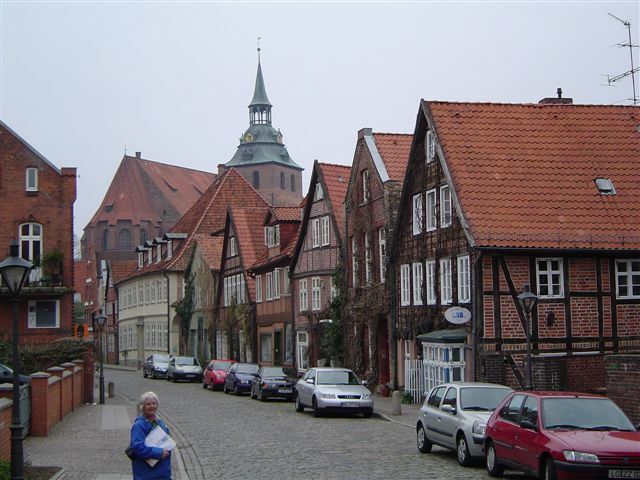 The Bach Week is staged in Lüneburg in his honour during the summer of each year, featuring performances of many of his works. We don’t as yet know where Hinrich was born, but Dr. Reinhardt says “As a register from St. Michaelis tells us (StadtA Lbg, Mich., R II, Nr. 66), he came from Hamburg. It is possible that he not only worked there before, but that he was born in this town”. He married Anna Catharina Otzmann in St. Michael’s Church, Lüneburg on 14 November 1719. 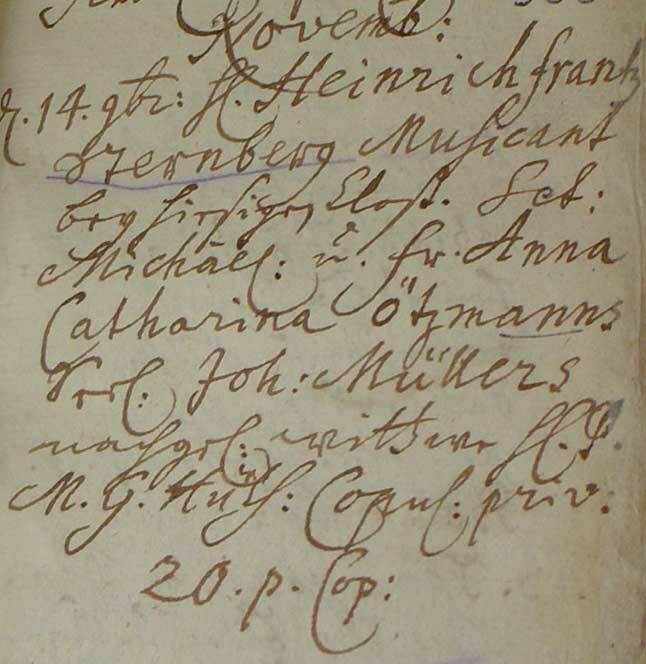 The marriage record tells us that she was a widow, having been previously married to Johann Müller. Hinrich and Anna had two sons and two daughters: Ernst Wilhelm, born 30 March 1721; Hartwig, born 7 February 1722/23; Sophia Amalia, born 17 March 1731/32; and Johanna Hinrietta Philippina, born 2 December 1733. 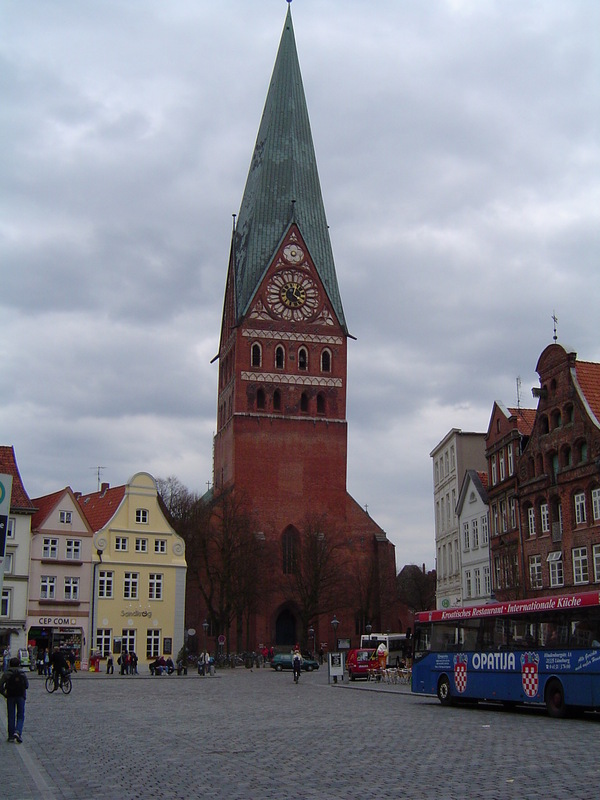 One of Hinrietta’s godfathers named at her baptism in St Michael’s Church, Lüneburg on 3 December 1733 was “Capellmeister Telemann”, the famous composer. Property records reveal that Hinrich bought No. 8 Kleine Backerstrasse from his father-in-law, Johann Otzmann, grain-seller, in 1720, and sold it in 1722. He bought No. 4 Stintmarkt, in the harbour by the fishmarket in 1735 and sold it in 1741. Hartwig was named after Hartwig von Toebing, Burgermeister who appears as his godfather at his baptism in St Michael’s Church on 7 February 1722/23. 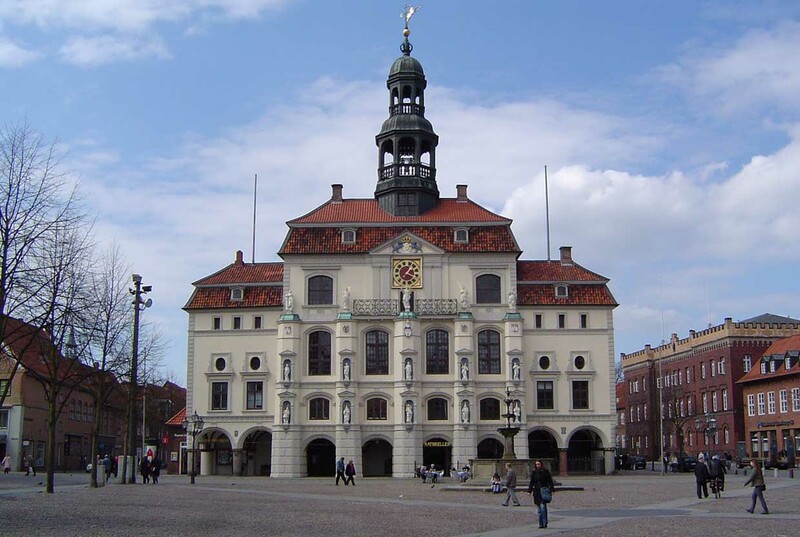 He succeeded his father as Town Musician in Lüneburg in 1757, a position which he held until his death on 11 June 1771, by which time he had become associated with St. John’s Church in Lüneburg, a Gothic church noted for its magnificent organ and its superb Baroque screen. At the time of his appointment as Town Musician, Hartwig was ‘hautboist’ [flautist] in the ‘Zandreische Infanterie-Regiment’. 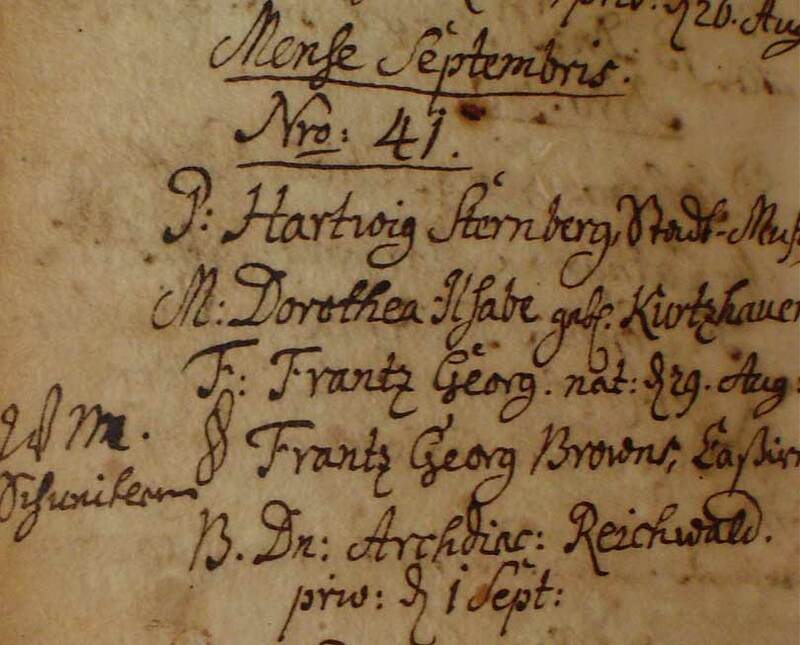 Hartwig married Dorothea Ilsabe Kurtzbauer (Spelling unclear – could be Kurtzhauern or Kurtzhauer) who died 30 May 1769. We have not been able to find a record of the marriage so far. They had only two children as far as we can tell: Rahel Sophie, born March 1760; and Francis George born 29 August 1761 and baptised in St. John’s Church, Lüneburg on 1 September 1761. In 1961, at the age of eighteen, between school and university, a school friend and I cycled from the Hook of Holland across the Netherlands and North Germany to stay with his grandmother who had lived in the old part of Lüneburg since the end of the second world war. Germany was rising from the ashes of that war in 1961 and the new president of the USA, John F Kennedy was featured on TV and in newspapers. Two years later, Kennedy gave his famous ‘Ich bin ein Berliner’ speech. Little did I know at this point of my life that I could say, with some historic justification ‘Ich bin ein Lüneburger’ ! I am a descendant of the Sternbergs. Nellie Sternberg (daughter of Thomas) was my maternal grandmother. My uncle Basil Wood (whom you acknowledged above) sadly died this month and the Sternberg stem dating back to Heinrich, like yours was passed to me by David Oulton at Basil’s funeral. So by my estimation we are second cousins.